Why rely solely on your gut and your team’s familiarity with your industry for content topics when you can use data to make informed choices? One of our favorite content development approaches to drive results is to use Ahrefs’ Content Gap tool. 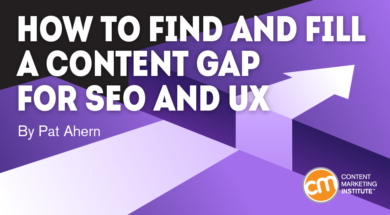 Plug in your website and your two biggest competitors’ sites and the Content Gap tool will reveal a list of search queries where your competitors rank well and your site doesn’t rank. 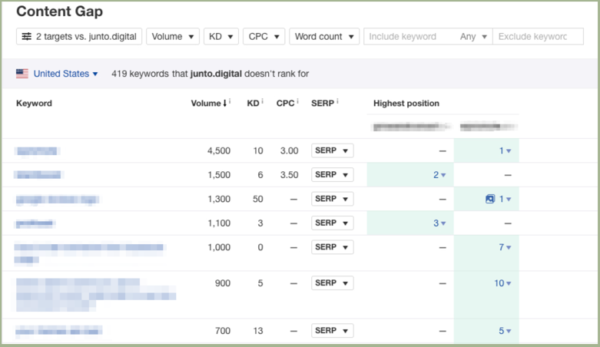 With this information, we prioritize each content gap opportunity based on its keyword score (calculated through the keyword analysis tool). The score is based on monthly search volume and competition for the query. We brainstorm for articles based on queries with the highest keyword score. Most writers jump into the writing process and look back once they complete their article. We start by asking ourselves: “Who is our target reader?” In other words, what type of person are we writing this article for? For example, what constitutes a “great” article for a chief marketing officer likely is not the same for a marketing coordinator. While each may search using the same keywords, their different roles indicate they likely are not seeking the same angle for that content. (To Brian’s credit, he chimed in with a short response to each of these three statements.) We could add each one into an element of a blog post. We also scour Quora for popular questions and answers related to our topic theme. We focus on answers that have the most upvotes to search for trends in great answers to Quora questions. We incorporate those points into our outline as well. Unless the answer is clearly “yes,” we go back to the outline and identify what else we need to add. With the detailed outline, we create the new content. With your draft complete, the next step is to edit your article. Our team breaks editing into two core components: (1) readability and (2) semantic search optimization. Ignoring content readability is the most common oversight we see. Why does it matter? Look at the two paragraphs below. Which would you rather read? You most likely answered the paragraph on the right, as the left one is begging to be ignored. And both paragraphs have the same text – readability, in this case, was only based on a visual perception. Ensure that paragraphs aren’t more than two to three sentences. Reduce the length of your sentences. Use the Hemingway App to break down complex sentences. Simplify your language – you’re not writing to impress your readers with your vocabulary. Incorporate screenshots, videos, and images to break up text. We aim for a middle-school grade level on our blog. However, more academic fields might aim for a higher grade. In 2013, Google rolled out its Hummingbird algorithm and forever changed SEO. At a basic level, it introduced the concept of semantic search – understanding the relationships between words – to decide which results to display. How do you do that? Our team focuses on term frequency-inverse document frequency (TF-IDF for short). The calculation identifies the frequency of words appearing in a small cluster of content versus a larger cluster of content. Words appearing a lot in a small grouping that rarely appear in a larger cluster of content would be more semantically relevant to the content in the smaller cluster. The TF-IDF scoring helps you ensure that you cover the most correlated topics within your theme. It’s also something you can do even if you don’t have a degree in mathematics. We use Clearscope to ensure that we hit the essential points of the theme we’re writing about. For those looking for a most cost-effective approach, SEMRush’s Writing Assistant serves a similar function. 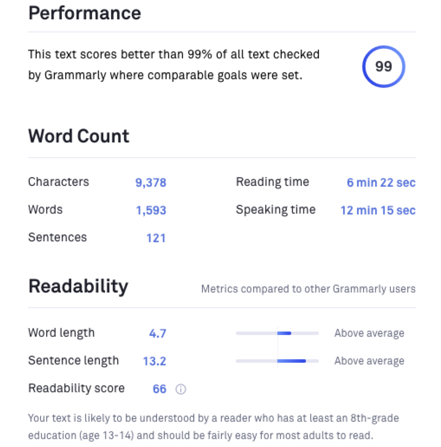 Once you’ve accounted for TF-IDF and readability optimizations, plug your article into an editing tool (we use Grammarly) to catch any spelling or grammatical mistakes. Optimize meta tags (title tags and meta descriptions). Optimize your headings and URL structure. Submit your newly published article to Google Search Console and Bing Webmaster Tools for indexation. I’d love to hear your thoughts. Is there anything that I miss? Leave a comment. Learn how other content marketers get their work done – and find great success – this September at Content Marketing World. Register today using code BLOG100 to save $100.